He was born in Calcutta, West Bengal. 1958-63 Diploma in Painting, Indian College of Art & Draftsmanship, Calcutta. 1965 Exhb., Artistry House, Calcutta. Tata and Iron Steel Company, Jamshedpur. 1968 He participated in the Paris Biennale. Had exhb. in Yugoslavia, Romania, Czechoslovakia, and Hungary. 1968 1st International Triennale, New Delhi. 1969 4th Paris Biennale, Paris. 1970-72 2nd International Triennale, New Delhi. Participated in the International Triennale, New Delhi. 1971 Solo Exhb., Doll Series, Birla Academy of Arts and Culture, Calcutta and Kunika Chemouold, New Delhi. 1972 Twenty-five years of Indian Art, Lalit Kala Akademi, New Delhi. 1973 Solo Exhb., USIS, Calcutta. 1974, 76 Exhb., Gallery Chemould, Bombay. 1977 Solo Exhb., Dhoomimal Art Gallery, New Delhi. 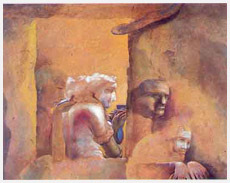 1978 Pictorial Space, Lalit Kala Akademi, New Delhi. 1978 New Contemporaries, Bombay. 1981 Indian Painting Today, Bombay 1982 Festitival of India, London. 1982 Contemporary India, West Germany. 1982 5th International Triennale, New Delhi. 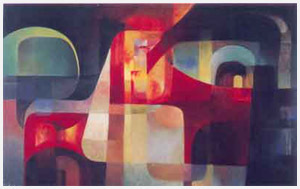 1982 Solo exhb., Calcutta Art Gallery, New Delhi. National Gallery of Modern Art, New Delhi. Lalit Kala Akademi, New Delhi. Bharat Bhavan, Bhopal. Chandigarh University Museum, Punjab. National Gallery of Modern Art, New Delhi. Lalit Kala Akademi, New Delhi. Himachal Pradesh Vidhan Sabha. Ministry of Education, Govt. of India, New Delhi. Chester and David Hertwitz Collection, Boston. Masanori Fukuoka and Glenbarra Art Museum, Hemeji, Japan. 1962 Received award from Academy of Fine Arts, Calcutta. 1971,72 Received the National Award, Lalit Kala Akademi, New Delhi. 1972 Received award, Birla Academy of Art and Culture, Calcutta. 1985 Award, East West Encounter, Bombay. 1987 Awarded Bangla Ratna, Calcutta. 1988 Awarded Padma Shree, New Delhi. 1989 Received Shiromani Puraskar. 1990 Nivedita Puraskar, Ramakrishna Vivekananda Ashram. Bikash Bhattacharjee mostly depicted what he saw around him but giving it a whole new dimension and existence. His rendition of an ordinary situation is passionate and intense, charged with emotions. Bikash not only enjoyed making portraits from ordinary life but also painted characters from theatre or films. Everyday happenings were noted down realistically through art. To him art has a purpose to reach out to people, and its main aim is to communicate. He did not believe in abstraction. He felt like a photojournalist, capturing images, at times focusing it, at times changing the frame, giving new angle and at times applying his own perspective. He mastered the technique of use light. The series called Durga epitomizes women in all their strength, beauty and completeness and possessed of the third eye. He believes this to be his tribute to female power. There is a touch of humanity in Bikashs paintings. 1968-72 Lecturer, Fine Arts Department, Indian College of Art and Draftmanship, Calcutta. 1973-82 Lecturer, Govt. College of Art and Craft, Calcutta.